What Explains Trump’s Focus on Manafort? 23 times Trump either denied any evidence of collusion between his campaign and Russia or alleged collusion between Hillary and … I’m not entirely clear who she was supposed to have colluded with. Whatever else this interview was, it was also a testament to Trump’s continued obsession with trying to deny any guilt. Which is why I’m so interested in both the form and the singular focus on Trump’s denial of Paul Manafort. SCHMIDT: A very short period of time. TRUMP: Three and a half months. [Inaudible] So, that’s that. Let’s just say — I think that Bob Mueller will be fair, and everybody knows that there was no collusion. The interview started with a discussion of Jeff Sessions’ recusal, which led Trump to claim he won because he campaigned better than Hillary, but then Mike Schmidt returned to Russia, which returned Trump to his “no collusion” line. Having already had two people flip on him and agree to cooperate with prosecutors, Trump starts by flattering Manafort. 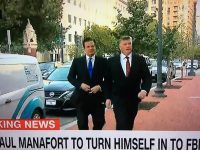 He rightly reminds that Manafort has long been tolerated in the Republican party, even after Manafort’s fondness for working with thugs became widely known. Trump then dismisses any Manafort taint based on time associated with the campaign (three and a half key months of the campaign, during the period when Russians were reaching out to provide dirt), not based on his actions for the campaign. Finally, by falsely claiming he didn’t know Manafort, Trump absolves himself of any prior taint the lobbyist had. As I said, I’m interested in this passage not just for Trump’s lame attempt at defending himself, but also that he did so. 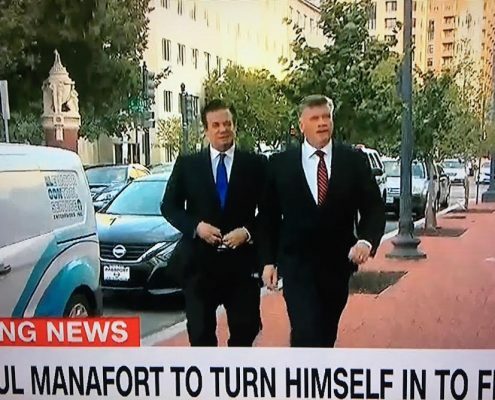 It’s only Manafort Trump feels the need to defend himself against, not Flynn (whom Trump reportedly is preparing to accuse of lying), not Papadopoulos, and not even Rick Gates (who, after all, hung around the campaign through the transition). The Daily Beast did do an uninteresting piece suggesting Mueller’s team may get a superseding indictment against Manafort, but it doesn’t even imagine Mueller getting to the guts of the case, perhaps by indicting Manafort based on his ongoing reporting on the campaign to Oleg Deripaska via Konstantin Kilimnik, the latter of whom also served as a go-between in an effort to help Manafort write a self-defensive op-ed. Instead, it imagines only that Manafort will get a superseding indictment on tax charges. Alternately, Schmidt may have said something during that off the record section that directly raised Manafort. Schmidt’s regular beat is the FBI, not Mar a Lago, so he may know something far more interesting than the Daily Beast does about where Mueller is going. Whatever the reason, Trump seems far more worried about damage Manafort can do to him right now than any damage Flynn can. 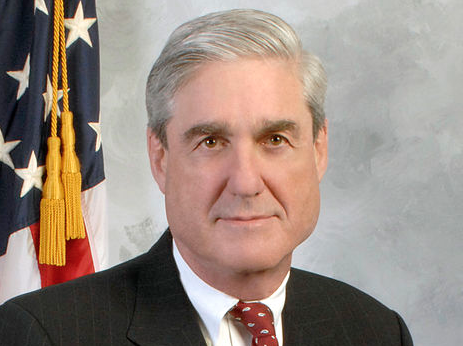 https://www.emptywheel.net/wp-content/uploads/2017/08/Mueller.png 346 463 emptywheel https://www.emptywheel.net/wp-content/uploads/2016/07/Logo-Web.png emptywheel2017-12-30 09:59:372017-12-30 10:55:52What Explains Trump's Focus on Manafort?